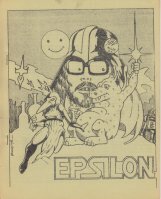 Epsilon (1976-1985) was my primary fanzine during my most active period in fandom and ran for eighteen issues. 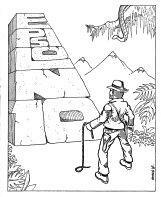 The first issue was litho-printed and this was expensive - more expensive than I could really afford, in fact. Which is why the second, though pasted up to be lithoed, ended up being surreptitiously photocopied at my then place of work. Unfortunately, early photocopiers would not copy large areas of black, so as a way of getting around this problem the cover as it appeared was a tracing of the one I'd prepared. 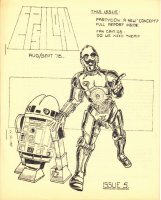 This is the thumbnail as it appears here but clicking on the link for that issue will show you the artwork as it was intended to be seen. 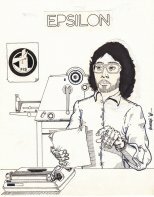 From the third issue onwards Epsilon was mimeographed - first by others then, when I got my own Gestetner, by me - but the cover of that third issue was a litho wraparound. 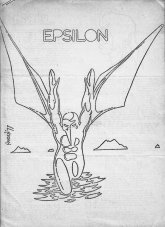 With the fourth issue, Epsilon switched from A4 to quarto, the size it would remain thereafter. The first three covers feature the alien birdmen I'd intended to be my recurring motif, but by the fourth issue Star Wars had come out and the cover for that and the following issue were inspired by that movie, just as that of the sixth was inspired by 'Saturday Night Fever'. From issue seven onwards I decided to make the title and issue number an integral part of the cover art (except on issue nine), and then had to come up with different ways of accomplishing this. 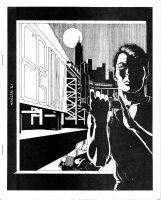 The covers for the seventh and eighth issues were inspired by the art in Jim Steranko's Graphic Novel 'Chandler', with the heavy blacks necessitating a return to litho covers for those issues. The birdman made a final appearance on the cover of issue eight as a sort of Maltese Falcon stand-in. 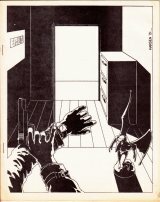 Five of the next six issues were collaborations. They're discussed under cover collaborations (article to be added later). 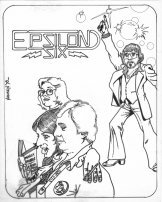 The final two covers were by me and involved more use of a ruler than actual drawing devoid as they were of human figures. Larger version of all the covers can be found using the links beneath the thumbnails.